I recently had the chance to speak to Karen Young and Payal Sharma at The Genki Spark, a Boston-based group doing cultural organizing with Asian women. I learned how Japanese drumming can be a source of personal empowerment and political action. The Genki Spark works to develop Asian women as artists and community leaders who can give voice to the challenges facing Asian-American communities, while celebrating the communities’ deep cultural strengths. The organization was founded by artist and organizer Karen Young in 2010. Intergenerational and Pan-Asian in its membership, The Genki Spark is made up of a core performance ensemble that puts on an impressive array of performances, workshops, and talks around the country. The organization’s work is based in the Japanese art of Taiko drumming. Taiko, an art form with a long history in Japan, was brought to the US during the 1960’s — specifically to San Francisco. So American Taiko grew up in the context of burgeoning Asian American activism, in a hotbed of radical youth organizing. Taiko became a medium for political and cultural activism — a way for Japanese-Americans to build a powerful cultural identity, and give voice to relevant community issues such as the internment of Japanese-Americans in WWII. While drawing inspirations from other strands of Taiko history, The Genki Spark is directly rooted in this tradition. In fact, Genki founder Karen Young’s relatives, Roy and PJ Hirabayashi, were trailblazers in Taiko-based activism in San Jose. (For more on American Taiko, check out this article by Hideyo Konagaya). Karen sees Taiko as a valuable way to foster individual empowerment, particularly for Asian women who face dual gender- and ethnicity-based expectations of subservience and gentleness. In addition to its history as a form of activism, and its cultural resonance, Taiko performance is imbued with physical strength. As Konagaya writes of taiko players, called sansei, they “physically acted out their resistance against inequality and injustice in American society and against their own passivity and weakness through actions such as whirling sticks over their heads, shouting, jumping, turning, and pounding on taiko.” As Karen tells me, the very act of hitting a Taiko drum with a huge stick can be an empowering experience for women, and seeing such performances can challenge audience members’ stereotypes of Asian women. The Genki Spark is part of a broader movement to challenge stereotypes of Asian women, and to address issues affecting Asian-American communities. The group supports many grassroots social justice efforts, and is often invited to perform at rallies and other political events. 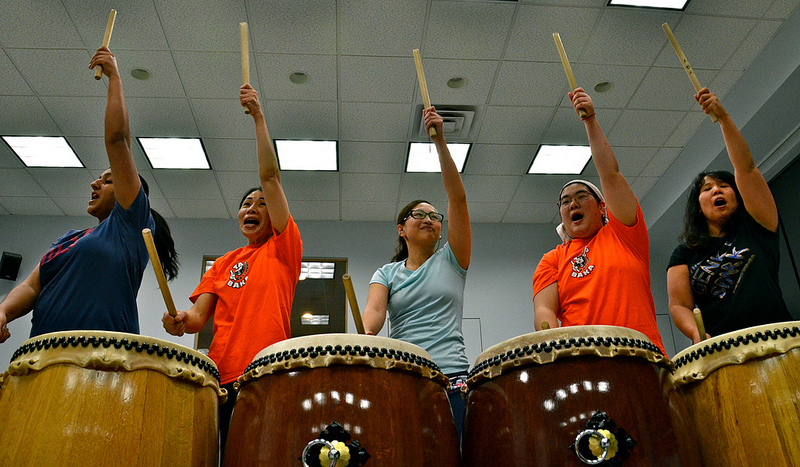 In addition, The Genki Spark is part of the national Taiko community and has goals for the art form. At a time when Taiko is being appropriated by US pop culture (including Katy Perry, Alicia Keys, and Mitsubishi), The Genki Spark keeps alive the tradition of Taiko as a medium for political and cultural expression. I cannot do justice to their performance in words, so please take a few minutes to watch the video below.